Some of these stocks are special order items. Special order items can take 6-12 weeks for delivery. 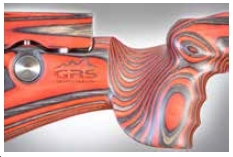 Stronger, lighter and more versatile than any other GRS stock made before. 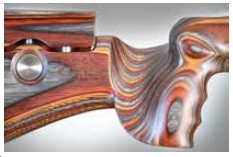 This is the start of a new generation rifle stocks with endless possibilities. · Ergonomic grip with black rubber surface. · GRS Limbsaver Airtec recoil pad. · Prepared for Versapod spigot. · Prepared for mounting Piccatinny rails. · 1 Piccatinny rail included. · 2 pcs. quick detachable flush cup sling mounts. · Canting of recoil pad in 5∞ increments. · 30-65% fiberglass reinforced rifle stock. · GRS SpeedLock II adjustment system (Patent Pending). · Brown and Green colour. · Recommended torque settings 5.2 nm. GRS BIFROST comes with more features and many clever details. It will be available for a wide selection of action inlets. 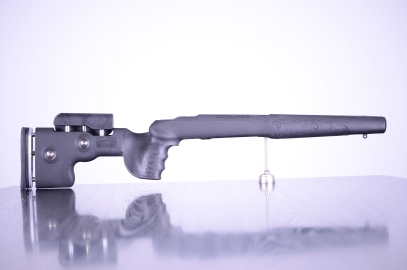 The great success of the GRS Berserk stock gave us inspiration to develop more rifle stocks in composite materials. The experience of many years and the new possibilities in strength lead to the new design of our brand new GRS SpeedLock II adjustment system (patent pending). This new adjustment system is once again stronger and, moreover, all added features come as a standard! The new GRS BIFROST (from the name of the Norse mythology bridge between the Earth and Åsgard) is stronger, lighter and more versatile than any other GRS rifle stock that we have made before and is perceived as the logical add-on to our already existing and successful GRS product line, which of course be continued. The main body of the GRS BIFROST is made of fiberglass reinforced composite materials. Our flush cup sling mounts allow you to quickly detach your rifle sling when necessary. Rubber surfaces on the ergonomic grip and on the fore end area assure full control during handling your rifle at all times. 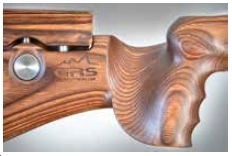 And the new GRS SpeedLock II adjustment system just makes it the perfect rifle stock to body fit. GRS Bifrost is light and strong as nails. Weighing only 1,3kg, it's easy to carry and easy to handle. Made of glass fiber reinforced composite materials. Rubber surfaces on the grip and fore end area assures full control during handling. The SpeedLock 2.0 system (Patent Pending) has LOP and Cheekpiece adjustment, height adjustable and canting adjustment as standard and will withhold the heaviest calibers. The stock is prepared for the use of piccatinny rails on the side of the fore end, and the rear stock for lights, lasers or other applications.It is also prepared for a VersaPod bipod mount (not included). Bifrost comes in green and brown colors and in LEFT HAND configurations! New for 2017 - The GRS Hunter stock replaces the Adjustable Hunter & the Decima Hunter. The cheek piece and the recoil pad can be easily adjusted with pushbuttons with the new and updated SpeedLock system. The new system is 40% stronger than the previous version and now stops on maximum adjustment. The SpeedLock system allows you to quickly adjust the length and height of the stock between shooting positions; no tools needed! At the lowest cheek piece position any bolt can be pulled out from any of the inlets we deliver.